The Irish Football Association is trying to terminate its international contract with Windsor Park owners Linfield, BBC Sport understands. It is believed Linfield have received a letter from the IFA, with the governing body wanting to end an agreement which stretches for another 80 years. A damning report on safety standards at Windsor Park will soon be published. Last week IFA chief executive Howard Wells called for government funding to keep the ground up to standard. Is the IFA right over Windsor contract? 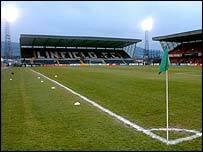 Neither the IFA or Linfield will confirm that the letter has been sent. A legal expert has told BBC Sport that the IFA hadn't "sufficiently addressed the issue of termination" when it signed the contract back in 1984. However, the contract does state that the grounds' trustees "should ensure that Windsor Park and its stands....are in good order, repair and condition" and this may offer the IFA an exit strategy from the unprecedented deal - although this is far from certain. The agreement gives Linfield FC 15 per cent of the money the IFA makes from tickets sales, advertising around the ground and TV rights connected with internationals. At the moment, that works out at approximately £400,000 a year. The report by stadium designers the Miller Partnership, expected to be published next month, is understood to say the Belfast venue doesn't meet with safety standards and is in a poor state of repair. In particular there are problems with fire safety at the Belfast ground. There are also major problems with disability access and maintenance is described as very poor. It's understood that as a result of information in the draft report a fire tender has been parked beside the South Stand for Northern Ireland's last two international games. The BBC also understands that the old Railway Stand at the stadium was closed for international games as a result of the report's initial findings. The IFA's insurers refused to insure the stand after reading the report. There is also criticism of the moat in front of the North Stand. There are also said to be problems with the West Stand, which was only built a few years ago, and the 6,000 capacity North Stand, where part of the roof blew off in the Christmas period.